Berkeley Heights, New Jersey, U.S.
Dennis MacAlistair Ritchie (b. September 9, 1941; found dead October 12, 2011), was an American computer scientist who "helped shape the digital era." He created the C programming language and, with long-time colleague Ken Thompson, the UNIX operating system. Ritchie and Thompson received the Turing Award from the ACM in 1983, the Hamming Medal from the IEEE in 1990 and the National Medal of Technology from President Clinton in 1999. Ritchie was the head of Lucent Technologies System Software Research Department when he retired in 2007. 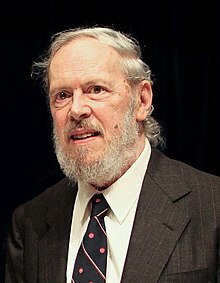 He was the 'R' in K&R C.
↑ 1.0 1.1 1.2 Lohr, Steve (October 12, 2011), "Dennis Ritchie, Programming Trailblazer, Dies at 70", The New York Times, retrieved October 13, 2011, Dennis M. Ritchie, who helped shape the modern digital era by creating software tools that power things as diverse as search engines like Google and smartphones, was found dead on Wednesday at his home in Berkeley Heights, N.J. He was 70. Mr. Ritchie, who lived alone, was in frail health in recent years after treatment for prostate cancer and heart disease, said his brother Bill. ↑ "Unix creator Dennis Ritchie dies aged 70". BBC News. October 13, 2011. Retrieved 2011-10-14. Pioneering computer scientist Dennis Ritchie has died after a long illness. ... The first news of Dr Ritchie's death came via Rob Pike, a former colleague who worked with him at Bell Labs. Mr Ritchie's passing was then confirmed in a statement from Alcatel Lucent which now owns Bell Labs. ↑ Rob Pike (October 12, 2011), (untitled post to Google+), retrieved October 14, 2011, I just heard that, after a long illness, Dennis Ritchie (dmr) died at home this weekend. I have no more information. Wikimedia Commons has media related to Dennis Ritchie. This page was last changed on 20 June 2018, at 03:11.